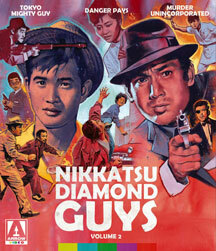 Nikkatsu Diamond Guys Vol 2 Archives - Horror News Network - The Horror News You Need! We have received the list of June 2016 releases from Arrow Video US. The list includes Nikkatsu Diamond Guys Vol 2, Suture, Return Of The Killer Tomatoes. You can view more information on them below.